Richard and Delphine want to say thank you. 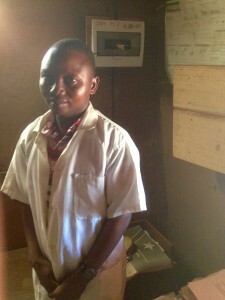 Last month, for the first time, Bobanganza clinic received solar light. Every room in the clinic is well lit. Now, lets be honest. This is a total of three small rooms, smaller than a typical American garage. But Richard and Delphine are quick to testify to the significant and immediate impact that reliable electric light has had on their ability to treat patients. “It is especially helpful when delivering babies at night,” they note, a regular occurrence here. The Bobanganza pharmacy is well-stocked in large part because of the medicines provided to the clinic through the Congo Clinic Initiative. Richard and Delphine collaborate with their supervising doctor to assess medical needs and keep their shelves stocked with appropriate medicines. Delphine and Richard, who are married, are both nurses and run one of the area’s best clinics. 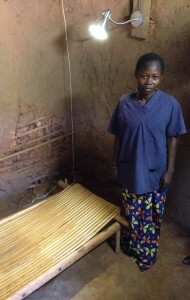 Their small clinic has a consultation room, a treatment room, a delivery room, and a small lab. With limited supplies and a microscope, Richard and Delphine are able to diagnose and treat sicknesses like malaria, tetanus, meningitis, pneumonia, anemia, and malnutrition, and intestinal parasites, in addition to dealing with things like farming accidents and snake bites. Adjacent to this building, they’ve also built a covered space for patients and their families to wait while they receive treatment. Richard and Delphine also deliver babies regularly, preform minor operations, and they provide life-saving medication to patients. 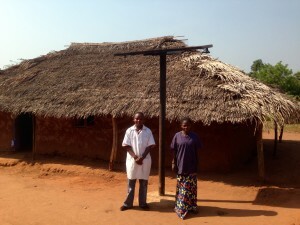 When cases require more advanced care, patients are referred to the Bogose Nubea hospital, located roughly 10 miles from Bobanganza. Paul Carlson Partnership is proud to partner with Richard and Delphine at Bobanganza. We invite you to join us in sponsoring a clinic in Congo and make a significant and immediate impact!